Ningbo Honber Industry & Trade Co., Ltd. 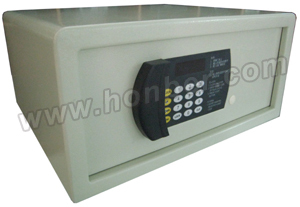 Recognized as an established, China-based supplier and manufacturer in the home & office security industry, Ningbo Honber Industry & Trade Co., Ltd. has been offering its customers quality home, hotel, wall, digital, and electronic safe. With both advanced technology and professionalism, the supplier is sure to meet each customer's demand. Our Personal Electronic Safe is a personal-size device that delivers the peace of mind that comes from a single, secure place for all the things that are too important to lose—like birth certificates, theatre tickets, family keepsakes, jewelry, and other valuables. This state-of-the-art electronic safe is perfect for home or office. If you are just looking for this item, we believe that our product can satisfy all your requirements with its strong protective feature. All of our exclusive devices have spacious interior which fits most laptops with LED display. For years, we've been enjoying good reputation as a supplier in the industry. We’ve been upgrading technologies in making better electronic safe products. Keep providing our customers world-class devices with worry-free protection is our goal and that's how we get stronger in the market. We specialize in manufacturing superior quality Security products including Electronic Safe and other products for various applications. Our good and high quality security products producing based on the fashioned equipment, advanced production technologies and rich experience. The interior fits most laptops with LED display. Override key for emergent opening and three levels of code management for guest code (4-digit), master code (8-digit) and intellectual management code. Plastic film keyboard with epoxy powder coating. Mounting bolts and floor carpet included. 100 pieces of safe opening record can be read on LED screen and printed by portable printers. In the electronic safe, there are 3 incorrect entries buzzer and auto-locking function; more than 100 degree angle to open door. Four pieces of 1.5V battery with low battery precaution for power supply. Various colors of wall safes are available and OEM orders are accepted also.